Head coach Scott Frost had 64 days to do what most college coaches have been doing for nearly a year. Head coach Scott Frost had 64 days to do what most college coaches have been doing for nearly a year. Even so, UCF signed 20 highly ranked recruits at Wednesday's National Signing Day who have the tough task of rebounding from a winless season. Emphasizing the need for fast players, Frost addressed both the offensive and defensive lines. A big part of that was recruiting players who are compatible with the new style of play Frost wants to implement on the field starting next fall. "We got some real hitters on the defensive side and some fast catchers and some guys who can run the ball on the offensive side, and we got a balanced class and I’m excited about all of them,” the former Oregon offensive coordinator said. Two recruiting standouts hail from far outside the Sunshine State. The first-ever player to sign with UCF from Hawaii, Mckenzie Milton, the No. 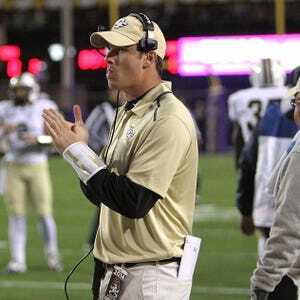 67-ranked quarterback, is expected to help the UCF offense add a new step to its stride. While Milton trained as a younger recruit at Oregon, Frost identified his future quarterback as not only one of the best players by far at the camp, but the best quarterback they saw. Along with some Hawaiian blood, a little bit of sweat from the Democratic Republic of Congo and Finland will join the team. Defensive linemen Chris Mulumba, who also spent time in Vantaa, Finland, will join the team after playing a little bit of defense for the Helsinki Roosters, a founding member of the American Football Association of Finland. But Knights fans can also expect to see plenty of Florida natives, including Adrian Killins from Daytona Beach. Ranked 102 in his position, Killins has the speed and qualities of a running back that Frost said he was looking for. “We’re excited about AK,” Frost said. “He’s really fast and we're looking to get as many fast guys into the boat. We’re excited about all these recruits. We think he is one of many who can really go and really run and is a game breaker and can be a game changer for us ..."
And from Pembroke Pines, Florida, Dredrick Snelson, ranked No. 20 in his position, might be just what the doctor ordered to help fight this offensive drought. “We need some guys who can come out here and be homerun hitters on our offense and guys that can take the ball in space and make people miss and score from a long way out, and I think we addressed that need, and Dredrick was a big part of that,” Frost said of the 6-foot, 192-pound wide receiver. The 20-player recruiting class landed UCF a No. 66 nationwide ranking, but that's not of much interest to Frost. “The recruiting rankings are what they are,” Frost said. “It’s flattering to see where you wind up. I recruited Marcus Mariota. He was a two-star [recruit] when we first recruited him and he only had three offers. If it was 100 percent certain which kids would be great players and which wouldn’t, this process would be a lot easier, and that’s just impossible. As for the 0-12 season, Frost said it didn't come up much during the recruiting process. With a new athletics director, coaching staff and troop of players, fans are anxious to see what UCF can do on the field. UCF will look to continue football operations with practices and team events starting within the next couple weeks during Spring Football. Evan Abramson is the Sports Editor for the Central Florida Future. You can follow him on twitter at @Evan_Abramson or email him at EvanA@centralfloridafuture.com.